US President Donald Trump yesterday paid tribute to the 2,977 people killed on September 11, 2001, warning that “savage killers” who threaten the US will find no haven on earth. 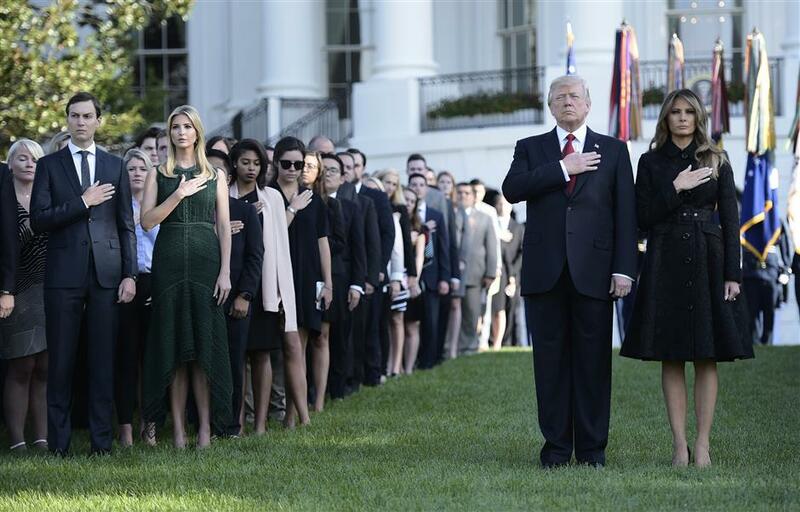 US President Donald Trump and first lady Melania Trump lead a moment of silence to mark the 16th anniversary of the September 11 attacks at the White House in Washington yesterday. US President Donald Trump yesterday paid tribute to the 2,977 people killed on September 11, 2001, warning that “savage killers” who threaten the United States will find no haven on earth. On the 16th anniversary of the attacks, Trump’s first as president, he observed a moment’s silence at the White House before laying a wreath and delivering a speech at the Pentagon, where 184 people died. “Those who try will soon join the long list of vanquished enemies who dared to test our mettle,” he said. In Trump’s native New York, at Ground Zero, there was a minute’s silence at 8:46am, the moment the first of two hijacked airliners struck the World Trade Center. In all, four planes were hijacked by al-Qaida militants who used them to topple the trade center’s twin towers and hit the Pentagon. The fourth plane, Flight 93, crashed in a field in Shanksville, Pennsylvania. “It was the worst attack on our country since Pearl Harbor and even worse because this was an attack on civilians — innocent men, women and children whose lives were taken so needlessly,” Trump said. The attacks remain the deadliest on US soil, plunging the US into a chain of rolling wars against Islamic militants, in which Trump has vowed to give no quarter. Next year, Americans who were born after 9/11 are due to be deployed to Afghanistan and Iraq for the first time. “We’re ensuring that they never again have a safe haven to launch attacks against our country,” Trump said. 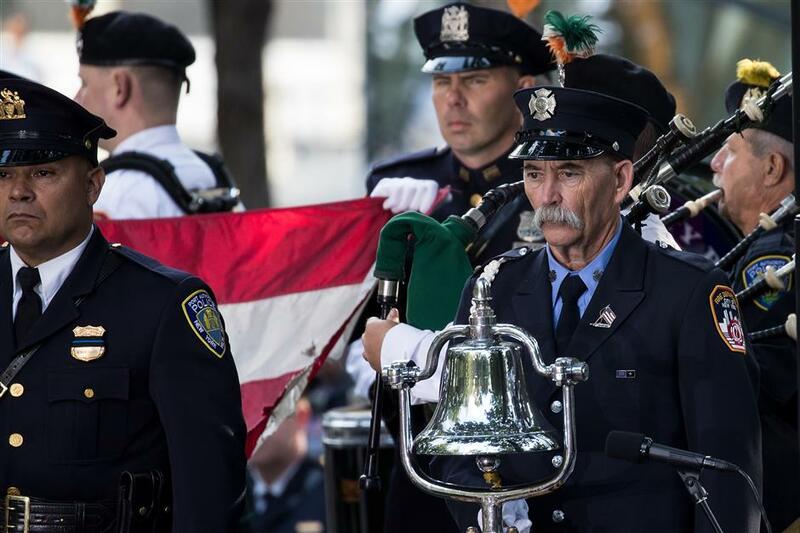 A firefighter rings a bell to mark the time the first plane hit the World Trade Center during a commemoration ceremony for the victims of the September 11 terrorist attacks at the National September 11 Memorial in New York City yesterday. At Ground Zero, relatives held photos and read the names of the loved ones they lost. Every September 11 since the attack, Rob Fazio has come to the place where his father, Ronald Carl Fazio, and thousands of others died. At least 1,000 family members, survivors, rescuers and officials were gathered as the ceremony at the World Trade Center began. After the minute’s silence and the tolling of bells, relatives began reading out the names of the people killed. Some said they couldn’t believe 16 years had passed since a tragedy that still seemed so present. To others, it was an occasion to plead for a return to the sense of unity they felt after the attacks. “Our country came together that day. And it did not matter what color you were, or where you were from,” said a tearful Magaly Lemagne, who lost her brother, Port Authority of New York and New Jersey police officer David Prudencio Lemagne. She implored people to “stop for a moment and remember all the people who gave their lives that day. Nicholas Haros Jr saw a glimpse of that cohesiveness in the country’s response to catastrophic recent hurricanes Irma and Harvey. “God bless, and be New York strong,” Maureen Tipping-Lipshie urged those affected by Irma after she remembered her brother, John James Tipping II. Some name-readers added messages ranging from the universal to the personal — updates on family graduations and marriages, memories of personality traits and favorite foods. Some have never even met the relatives they lost. Defense Secretary Jim Mattis and General Joseph Dunford, chairman of the Joint Chiefs of Staff, were hosting a private observance for victims’ relatives at the Pentagon.